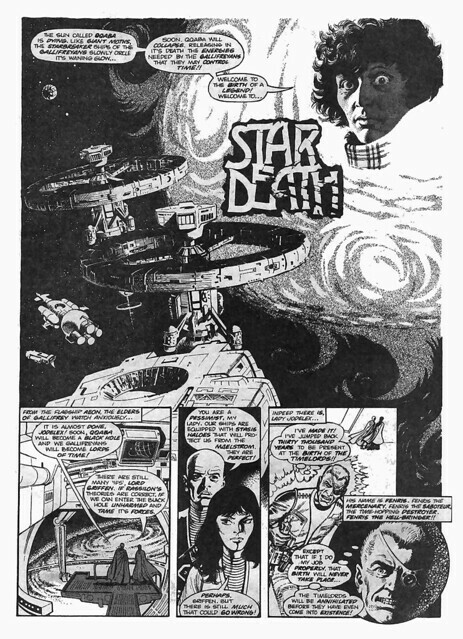 This story is set on Gallifrey, this is one of five collaborations between writer Alan Moore and illustrator David Lloyd, who would go on to create the graphic novel V for Vendetta. It was reprinted by Marvel in The Daredevils issue 5, where this is taken from. You can see all pages here, they are the last 4 in the album. This story, along with the 4-D War (yesterday) and Black Sun Rising (tomorrow), takes place during the Black Sun War.